In the various corkscrew clubs, there is a tradition of publishing your best 6 corkscrews for the year. 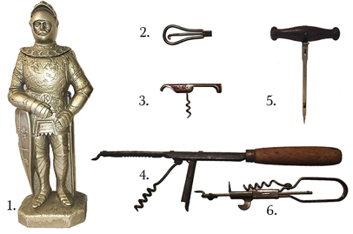 As the end of the corkscrew fiscal year nears, figuring out which corkscrews make the list, and which ones don't, makes for a fun but difficult decision--below you will find my best 6 for this year, and links to previous best 6's. 1. Syroco Knight corkscrew in silver. Over the last couple of years, two Golden Knight corkscrews have turned up with business cards and in boxes, both marked for Kinsey Whiskey. 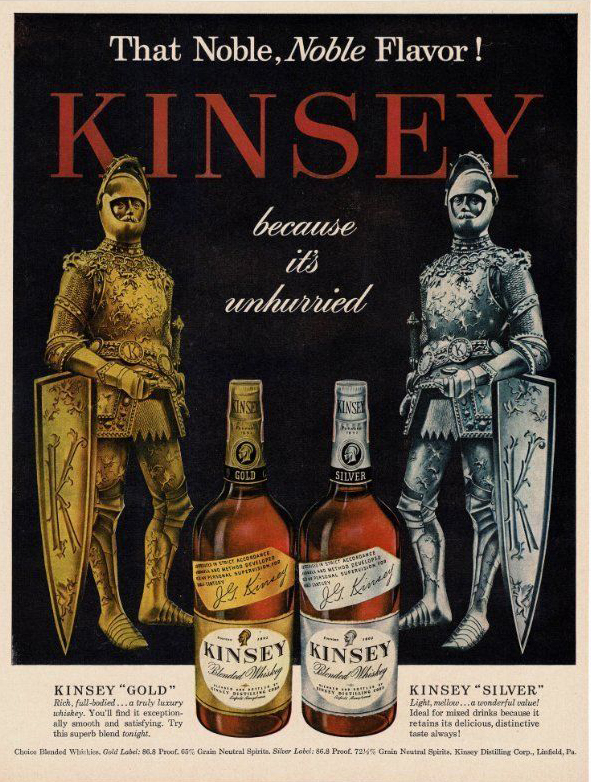 In doing further research, I unearthed a 1946 advertisement for Kinsey Whiskey, “That Noble NobleFlavor!” featuring both the Gold and Silver Knight, advertising Kinsey’s Gold and Silver Whiskies. This, along with confirmation from the family that started Syroco that they were producing promotional items for other companies, would suggest that that the Gold and Silver Syroco Knights, are Gold and Silver Kinsey Syroco Knights. 2. 1888 patented (#379,010) Benjamin Greeley cork puller. Marked with the patent date “ MAR. 6, 88.” I actually found this while traipsing around a flea market when I spotted a tray filled with button hooks. After getting approval from the dealer, I flipped the tray over, and rifled through; a great 5 dollar find. While at Brimfield last year, this was traded away to Addict Tommy Campnell, who this year, was kind enough to trade it back! (see O’Leary, page 78). Thanks Tommy! 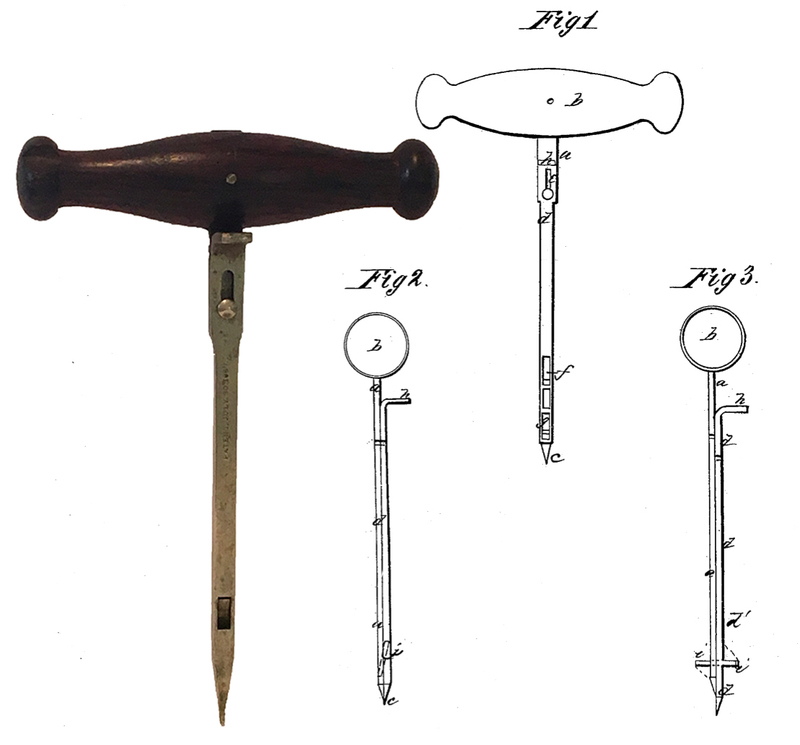 “The operation is as follows: The cork-drawer being in the position indicated in Fig. I, it is forced down into the centre of the cork until the swing-bar has been pushed beyond the bottom of the cork, when, on drawing up the cork-drawer, the friction of the cork on the sliding prong d causes it to descend, b which the swing-bar is placed in a right-angled position to the prongs, and the cork follows the instrument as it is drawn out of the bottle. The cork being drawn, it is easily disengaged from the prongs by sliding back the prong d by means of the thumb-piece and drawing it off, when the cork-drawer is again ready for use. 6. Richard Itaru Nakamura filed a patent application on January 9, 1947, for his Frame with Slidable Tool Bit. After a lengthy wait, his patent (#2,512,238) was finally approved on June 20, 1950. This one is marked “OLYMPIC, FINE STEEL TIN CUTTER.” (see O’Leary, page 156).